Home / Broomball.com Blog / Growing the game part 1 in Duluth, Minnesota! Growing the game part 1 in Duluth, Minnesota! For years I was one of the players that was organizing open brooms and getting new players in the game. Our leagues were strong in the area with 6-8 competitive men's teams playing indoors and 30-40 men's and co-ed playing outdoors. Broomball was booming in the Twin Ports. As my kids got older and busy with hockey and other sports I had to make choices. As time went on, we lost our outdoor league and our indoor league was struggling. I contacted the indoor league and suggested creating a Facebook group to help promote the game. The league did not embrace the page and I was not the best person to market to millennials. 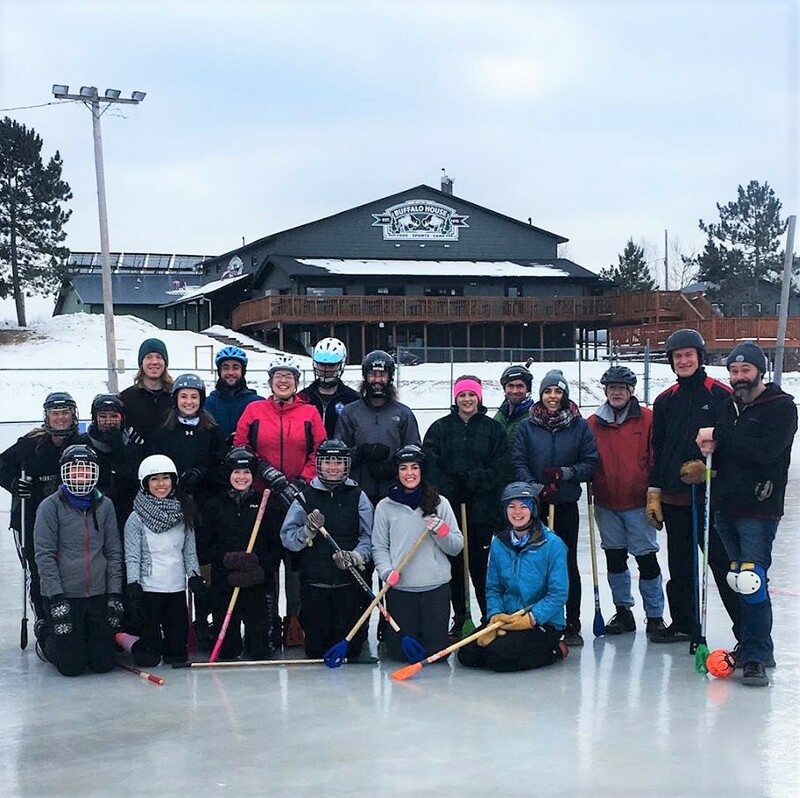 A year ago, a couple of local grad students (Rachel & Abbie) called me and said they loved broomball and wanted to start open broomball in the area. I met them for coffee and they were fun, enthusiastic and I felt they would do a great job promoting the game to a younger generation. They did! Our Facebook group went from 60 members to 207 in one year. Our open broomball sessions averaged 15 players and sometimes as many as 30. This is our 2nd year of open broomball in the Twin Ports and there is a ton of broomball energy. We play indoors on Wednesday and outdoors on Saturdays. Rachel & Abbie have grown the game organically by promoting through social media and word of mouth. They created flyers and posted them around town and this year made a sticker to help promote the game and give one to everyone that attends. They also baked cookies and handed them out after broomball. They meet with everyone before playing and do a name game to get to know each other and explain that the open broomball is meant to be fun. After the game they give out spirit awards to those who were the best team players. Broomball.com has provided equipment for new players. I have really enjoyed watching this blow up. It has been so fun to watch the players improve. A number of our open broomball players have now joined the indoor league. I could not have done this on my own. I certainly would not be baking cookies and giving out spirit awards, but Abbie & Rachel taught me a few things about promoting the game of broomball.